In this episode recorded on the 11th April 2019, we discuss the recent stolen election in Israel, Carlos Slim turning a new card, fake space probes, has Turkey left NATO? and much, much more. Also, we’ve clearly hit a nerve with some groups and our interview was disrupted when my router was attacked just as Benjamin was about to reveal the real reasons for distractions. It’s within milliseconds of him about to say something and is extremely abnormal. I am going with ALICE the AI, but it could easily be Mossad or another group. It took some time to fault find the problem and it ended the interview early. The old system IS collapsing and we’re seeing the death throes of the old guard. Until we’re finally fully liberated, we must keep applying pressure to the old system. 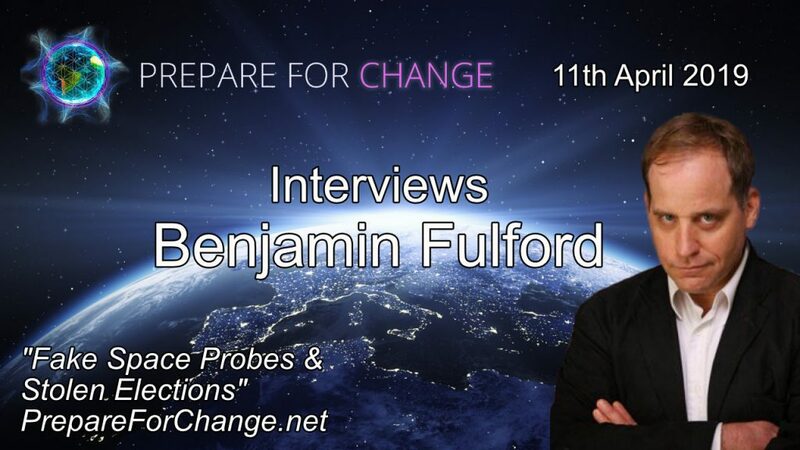 Let’s take our cue from Benjamin Fulford and turn our world into a wonderful place! As Benjamin says, don’t just sit on the sidelines, pick up the phone and call your elected officials and respectfully demand answers to these gross atrocities that have plagued our way of life for far too long. The stronger our collective voice, the quicker we affect change. We are an all-volunteer organization. We do set aside a little money to support our website, but nearly all of your donations to PrepareForChange.net support about 460 children in an orphanage we funded in Malawi, Africa. Think about donating to these children, who have lost their parents. You can donate here. As always try to raise your vibration and remain loving to one another, we’re all one, and we’re all going to bring about a new world! This entry was posted in Cabals & Conspiracies, Deep State, Geopolitics and tagged Benjamin Fulford, Fake Space Probes, Interview, Prepare for Change, Stolen Elections, Technology. Bookmark the permalink. Psychic Sounds by B: B Weeklies ~ April 15th through 22nd 2019 ~ Unexpected love and Unexpected communication.